I’m always looking for ways to reuse things – especially old furniture. I’m also always looking for creative ways to spruce up my backyard and flower garden. You can’t even imagine how excited I was to come across these different ways that satisfy both of my passions – decorating the flower garden and doing it with old furniture! If you’ve ever wondered what to do with that old desk or maybe thought that you just have too much unused furniture in your home, this is definitely a collection that you’ll want to save. 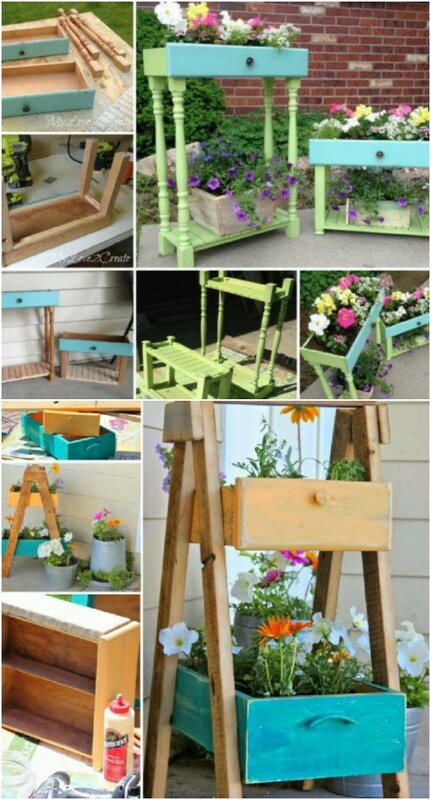 There are so many creative ways that you can incorporate old pieces of furniture into planters and flower bed decorations. Along the same lines, you really should check out these 70 summery backyard projects – they’ll give you great ideas for adding to the beauty of your outdoor living spaces. Now, back to upcycling furniture into garden decorations. Most of these are such easy projects – you literally just have to figure out where you want to place your furnishings. 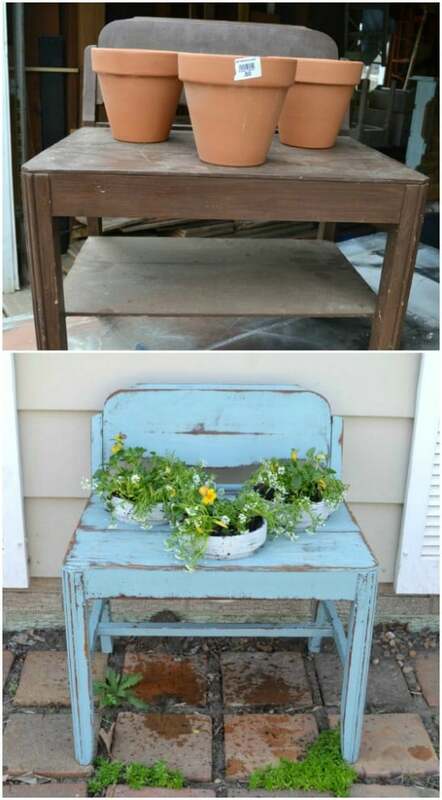 Whether you want to turn an old dresser into a lovely planter for flowers or you have a broken chair that you really can’t sit on anymore – there’s a project in here that will help you turn that chair into a great succulent planter, there’s definitely going to be something in here that you can use to upcycle that furniture and turn your flower bed into a gorgeous display. My backyard had a lot of tree stumps when we first moved in. I hated those stumps because I felt like they took away from the beauty of the yard. I turned many of them into planters and you can, too. Just take a look at these different planters and ornaments that you can create from tree stumps. Once you’ve handled the stumps, you can get busy moving that old furniture out to the flower bed to really give the neighbors something to be jealous of. I absolutely love upcycling and these projects certainly give me something to smile about. Whatever furniture you have that you need to reuse, you are sure to be able to incorporate it into your flower bed design and have a gorgeous garden that is sure to give you somewhere to relax and reflect when the flowers are in bloom. 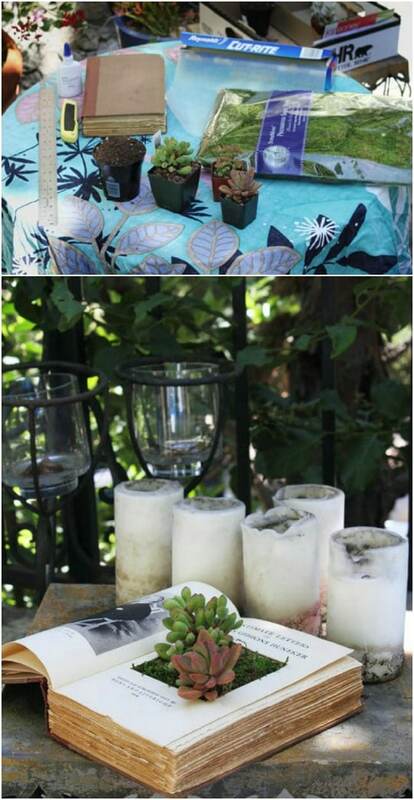 I can’t wait to hear how you’ve decorated your backyard with furniture – Let’s get started! 12. Throw In The Kitchen Sink! 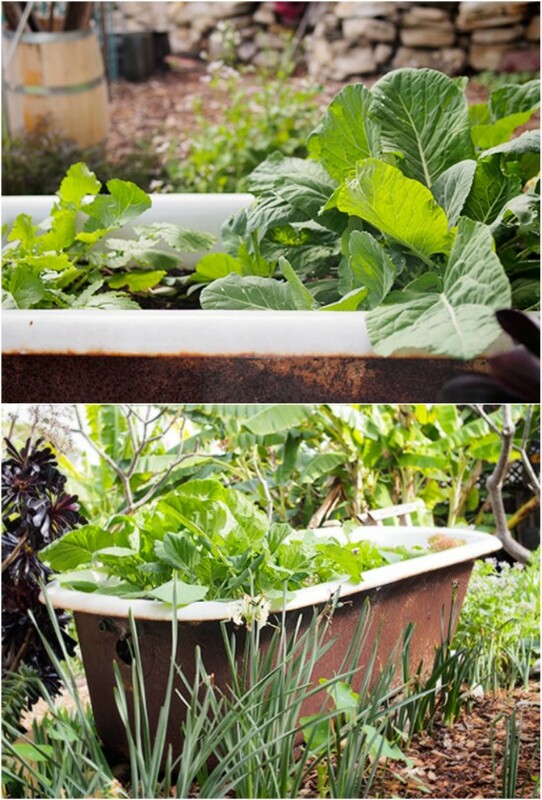 I really love the idea of turning an old bathtub into a planter. This would be great for displaying those gorgeous sunflowers, and the tub doesn’t even have to be in great shape. Even if there are holes, you are going to be able to turn it into a planter that beautifully displays whatever plants you want to house in there. I think trailing plants would also be great – or mix and match to create your own little mini flower bed right there in the tub. I’ve had so many broken chairs in my lifetime that I’ve thrown away. I really wish I had thought to use them as planters. I really love the idea of making a little succulent garden from a seat less chair. You can stick the planter right down in the seat and this is a great way to bring dimension into your flower bed. Just sit the chair among your other flowers and it raises those succulents up off the ground so they become the focus of your flower bed. 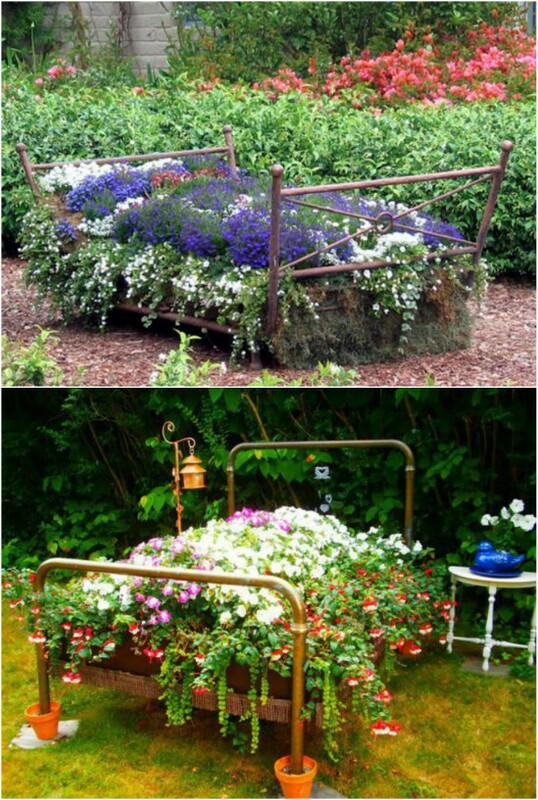 This is such a great way to reuse an old bed and give you an interesting garden design at the same time. 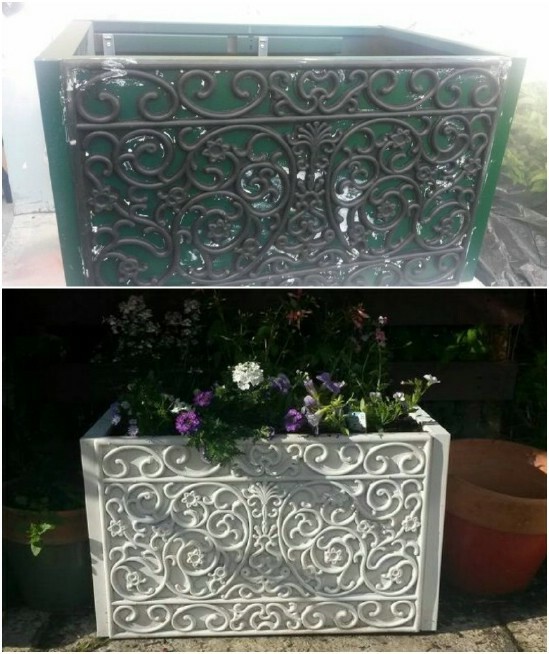 If you have an old metal bed that you just don’t want to throw out, turn it into a vintage looking planter instead. Fill the bed with rather short flowers so that they don’t draw attention away from the bed design. You could even do different colored flowers at the top to look like pillows. Okay, so books aren’t technically furniture – but bookshelves are. So, you take these great book planters to house your succulents and then place them on your old bookshelf. Maybe add some trailing plants to the top and sides to give it a good cover. Reading is my favorite pastime so this entire project is at the top of my to do list. What a great way to bring some culture into your flower bed, and it will be the perfect place to relax with a glass of sweet iced tea and a good book! This desk planter is so creative and so gorgeous. You just paint your old desk whatever color you want – or leave it distressed if you prefer – and then use the drawers to hold your flowers. You could also add some old desk organizers, an old telephone or lamp, or anything else that looks like office supplies to it to give it a great outdoor office look. What a wonderful display for right outside your home office window! Add the chair and turn it into a planter as well. 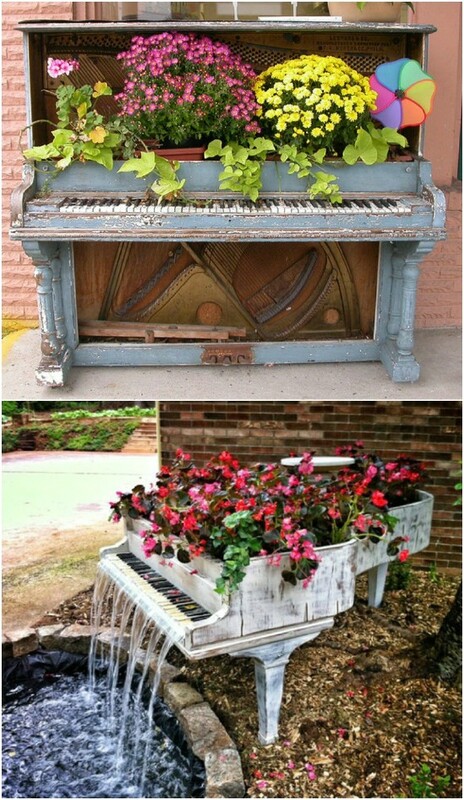 I don’t know if you actually have an old baby grand piano that you would want to turn into a planter, but how gorgeous is this? It’s an old piano that has flowers and water features. I’m thinking you could incorporate the same design idea with an upright piano, and people sell those all the time for just a few dollars when they are no longer tuneable. Imagine how relaxing and beautiful your flower garden will be with a piano water garden right in the center! Here’s another great way to turn those broken chairs into garden decorations. Add hostas! Hostas are my all-time favorite plant. They are so versatile, so gorgeous, and so easy to grow. The foliage comes in so many different colors and designs that you could use several chairs for each type of hosta and have an entire collection of planters. Plus, what else are you going to do with a chair that doesn’t have a seat? This old wooden headboard looks wonderful as a new box planter. This is so easy to do – if you don’t already have a box planter that you can add to the headboard, you can build one really quickly. I love the colors in this one, although you can do whatever colors match your exterior. I really love how easy this one is to build, and it’s perfect for any type of flower or foliage plant you want. First of all, I love the idea of using an old dresser for a succulent planter. Second, I absolutely adore the idea of leaving the mirror in the dresser. This is a great way to gain some depth and make your garden look larger – perfect if you have just a small space to work with. Also, the mirror reflects the plants and flowers so you get double the color from the blooms and foliage. With a bright coat of paint, this old worn out dresser is instantly transformed into a lovely planter for flowers and other greenery. You could sit this right on the patio or add it to your flower bed to add dimension. Any time you raise your flowers off the ground, you are providing a focal point. 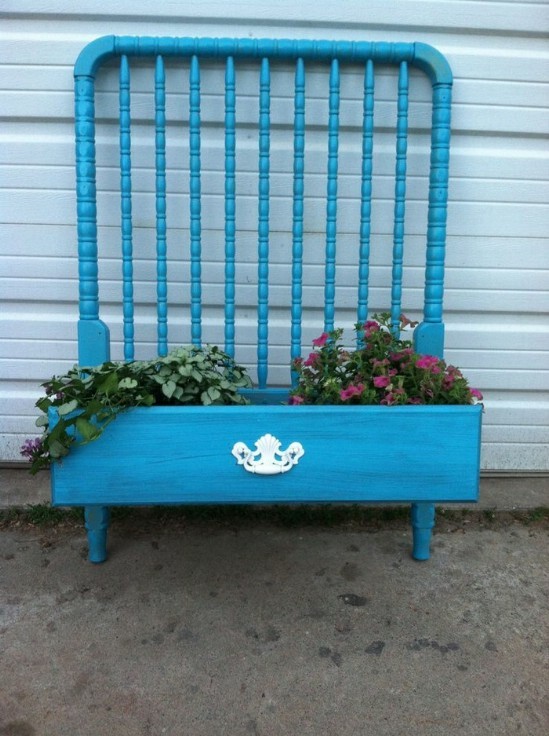 What better focal point than this beautiful dresser turned planter? And, it’s such an easy to do project that you’ll be sipping tea and admiring your lovely blooms in about an hour. 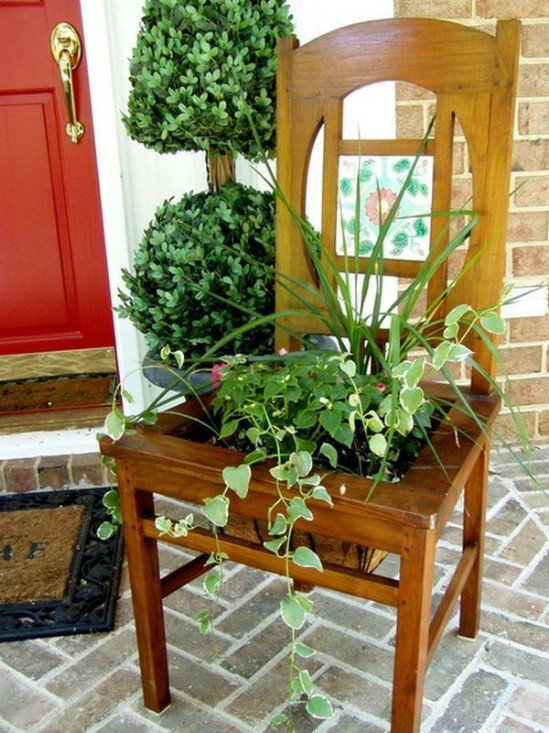 The addition of a small table makes this armchair planter even more adorable. I love how the plants just fill in where the seat should be. 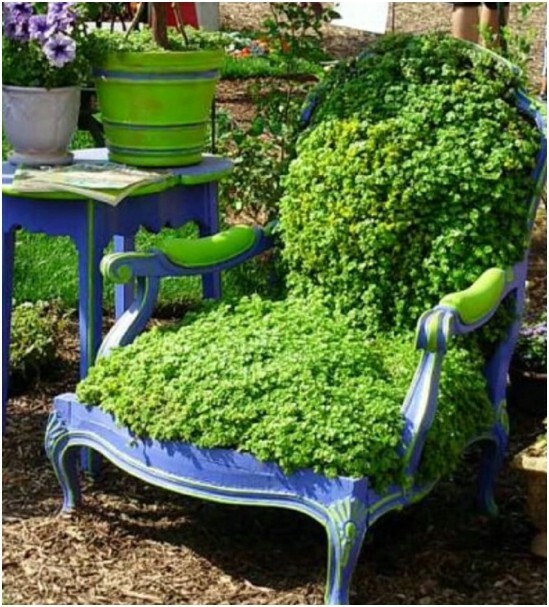 You can add vine type plants, hostas, or really anything you want to get a great look from your old armchair. Note that this chair has a wooden base – I really wouldn’t recommend using an armchair that is all fabric, so leave your hubby’s old worn out recliner where it is ladies. So a kitchen sink may not technically be considered furniture, but if you have an old one laying around, you can certainly use it as a planter. I really love this idea – and I think an old bathroom vanity would work well, too. 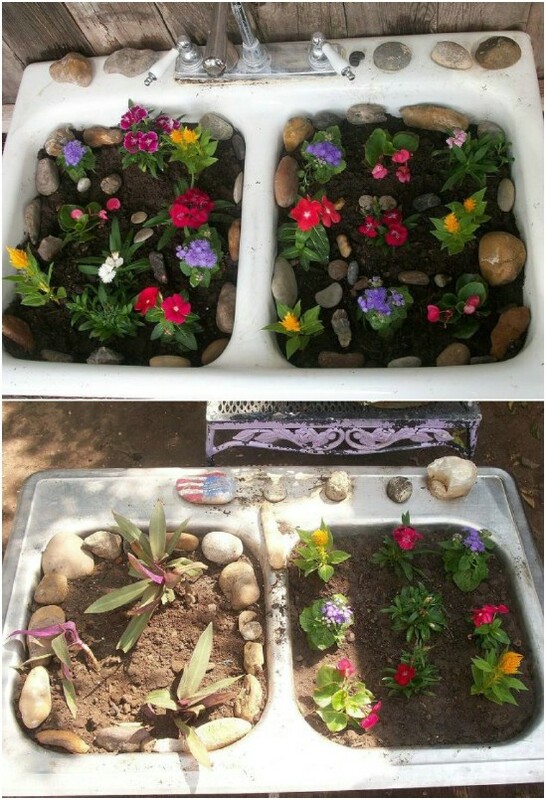 Just add your plants and then display the sink wherever you want to add some whimsical charm to your flower bed. You can turn an old chest of drawers or one of those slim medicine type cabinets into a great planter for all sorts of flowers. Just fill the drawers with potting soil and add your favorite blooms. I like this thin cabinet because it doesn’t take up too much room but it gives you loads of space for adding trailing plants, flowers, and even succulents if you want. Sometimes you just have a few drawers that you need to upcycle. If you don’t have an entire dresser or cabinet to use, just use the drawers. You can easily add legs, which will raise your planter up to eye level when you’re sitting on the patio, and these planters are super easy to build. I love the contrasting colors used on these – but again, you just do them in whatever colors you want, or just add some fresh stain and distress them a bit. An old corner cabinet and a few drawer fronts give you what you need to create this really unique corner cabinet planter. This is so perfect for adding some dimension to the corner of your flower bed, or you can sit it up against the house in a corner that is a bit too boring right now. It’s pretty easy to build and you can fit three drawer planters in here easily, so you’ve got loads of room for blooms. I love these old vintage sewing cabinets. My grandmother had one when I was younger and it was my favorite piece of old furniture. I really love the idea of incorporating this antique looking cabinet into the flower bed. Or, you could just use it as a planter on the porch or patio if you prefer to keep it closer to the house. The drawers are the perfect size for adding succulents or flowers and the entire look is one of vintage loveliness. An old coffee table is perfect for a raised planter. Whether you want to use this on the patio or in the flower bed, it provides the perfect place for adding flowers of all types. I love how it raises the flowers off the ground, so add your favorite colors and foliage to this one because it will instantly become the focal point of your flower bed. It’s so easy to transition that old coffee table into a raised planter! Along the same lines as the headboard planter, you can turn your baby’s old crib into a great garden decoration and planter. I love the vintage crib look, especially in the garden. If you know that you aren’t going to need that crib again, or you just plan to buy a new one if and when you do, you can easily turn it into this gorgeous planter. I really love the bright blue especially with contrasting colors. It will definitely be a conversation starter. If you’ve decided to redecorate your home office and you are wondering what to do with those old filing cabinets – you can turn them into planters! Even if you don’t have an old filing cabinet to use, these things are normally pretty cheap, especially if you get one that doesn’t work as it should. It’s still going to be perfect for creating this lovely planter. I love the scroll work on this one – and it’s much easier to make than you may think. 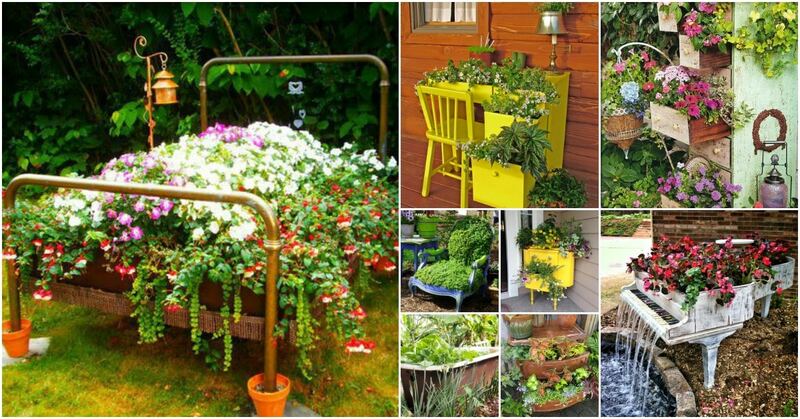 You really can make a garden planter out of just about anything – including that old metal or wooden bench. I have one of these metal benches that I use as a step stool to reach things that are just too high. If you have one, too you can turn it into this lovely planter to hold succulents or flowers and sit it right in the center of your flower bed. Cut holes in the seat to hold your pots or you could cut out the seat and stick a larger pot in there. I absolutely LOVE the baby grand water fountain. Wish my mom hadn’t sold mine years ago. Wherever did you find one at a reasonable price? Such a great idea!